Jan and I headed next from Two Medicine Campground on the east side of Glacier to Many Glacier Campground further north on the east side. In order to get there we need to go back to Route 2 east and then take Route 464--about 70 miles or so. This is part three of our Glacier visit. To see the previous visits at Apgar and Two Medicine, look at the issues below. 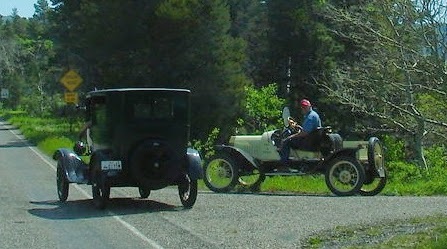 These two antique cars were at the entrance to Two Medicine as we left. When these cars were new, the owners were guaranteed to be stopping every so many miles for tire repair and other mechanical fixes. All we can think of is that they are far,far from any help. 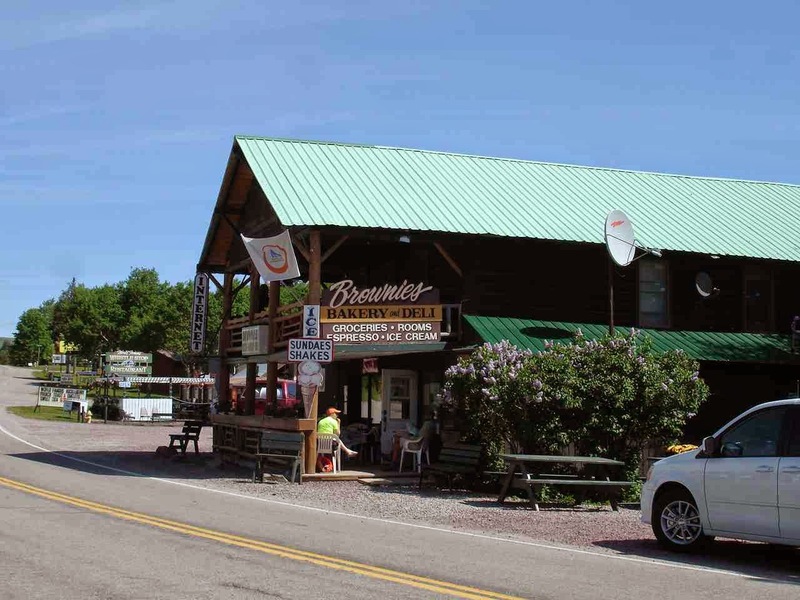 East Glacier is on the way out to Route 2 and there are some enticing stops such as Brownies. They were advertising Huckleberry pie. Well, who could resist? We picked up two slices of pie for our dinner later, some cinnamon pastry, and a blueberry cream pastry that was absolutely delicious! 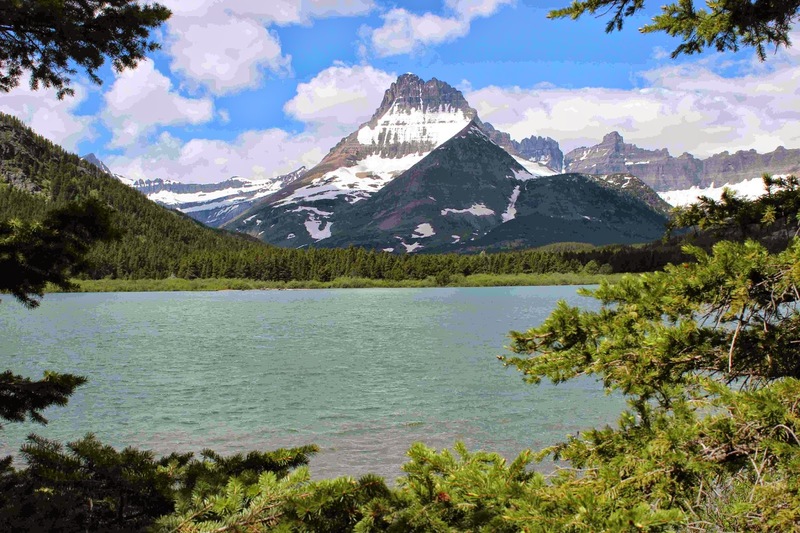 For any of you making the trip, Route 464 is a great way to Many Glacier. The road is 70mph( still a narrow 2 lane road)but the views of the mountains and the wide open "big sky" are breathtaking. The picture above is from the entrance road to many Glacier. The one glacier that would be visible is covered by snow. By the way, this road was terrible , probably from the snow and heavy rains. Lady Blue is happy in a very comfortable site. The elevation here is about 5,000 feet. 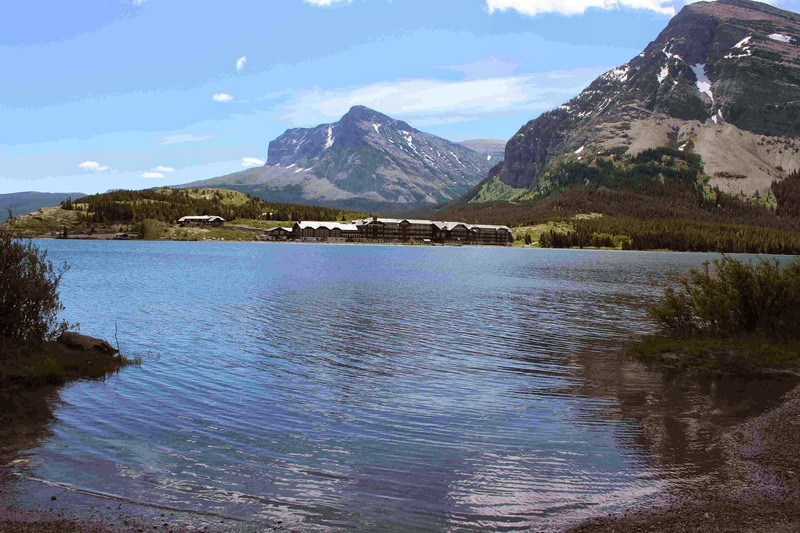 We are a very few miles from Canada and there was a temptation to go to the Canadian entrance for Glacier, Waterton Park. But we decided ,no, for this trip. As in the other campgrounds, we have no phone or internet. Surprisingly, we also had no satellite radio. 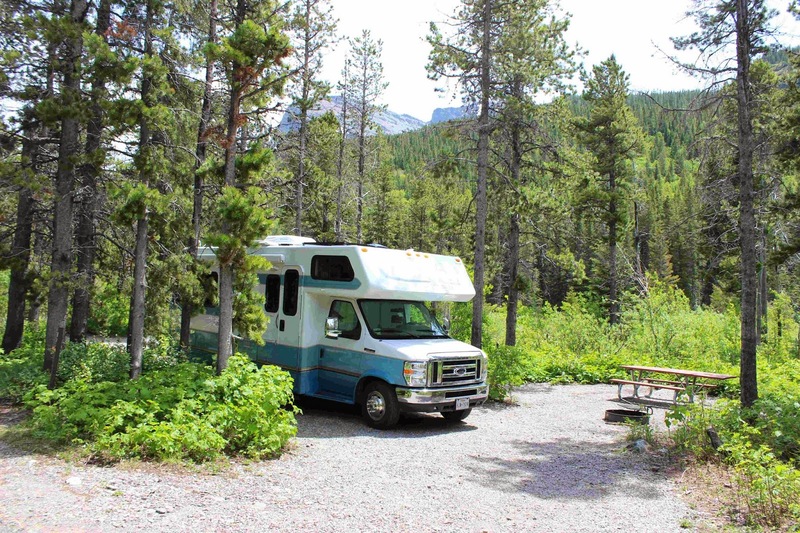 We also learned, after seeing how full this campground was, that this is the most popular campground in the park. There are trails all over and some right out of the campground. 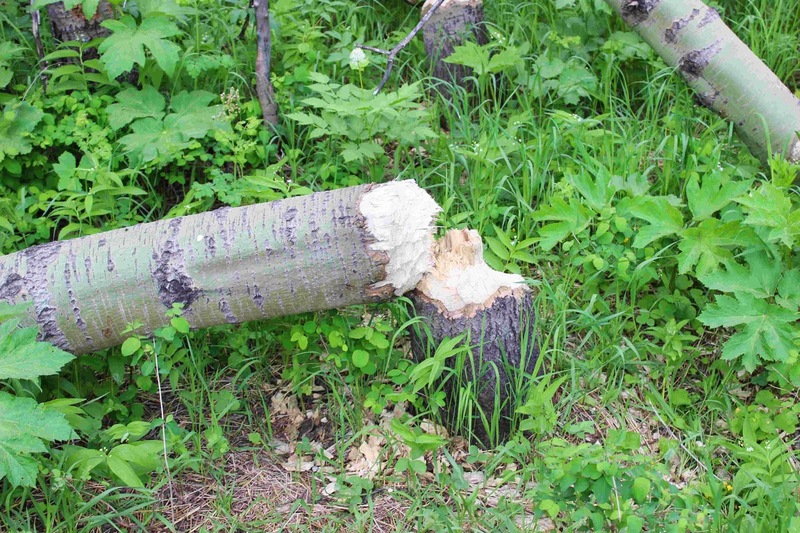 Some obvious new signs of beaver. 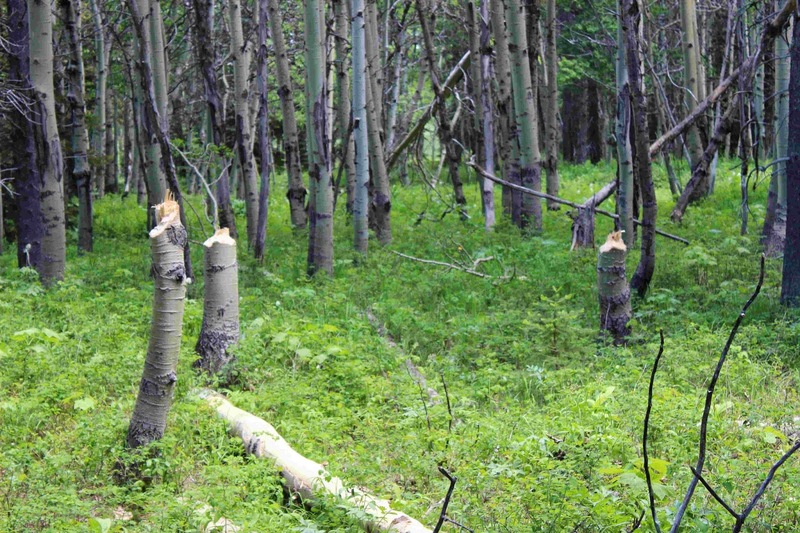 Jan and I stared at these beaver cut stumps for a while , wondering about how big these beaver were. Yup----you already guessed it. These were cut in the winter or spring with a fair amount of snow still on the ground. Signs of spring all over. 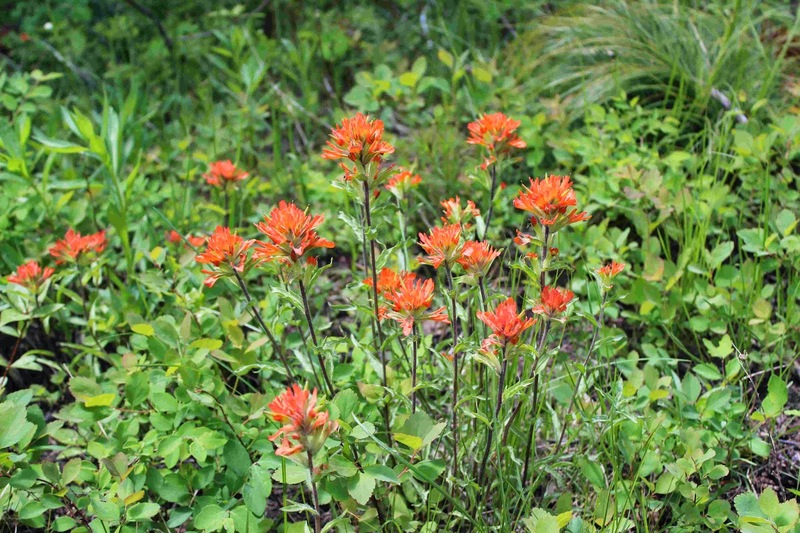 Even a variation of Indian Paintbrush. 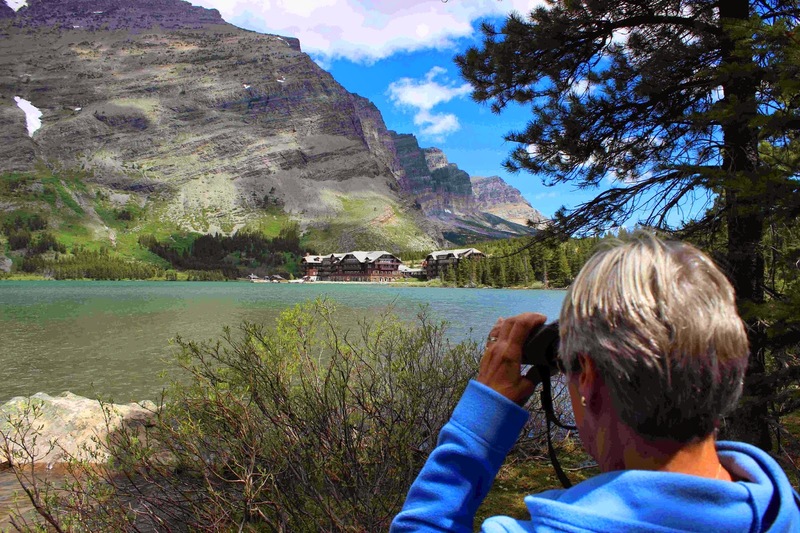 Along our trail around Swiftcurrent Lake is a great view of Many Glacier Hotel. This was the "gem of the west" when it was built in the early 1900's. We were picking up a trail map at the ranger station when we overheard a couple in front of us describing their encounter with a grizzly bear on the Grinell Trail. Evidently the bear didn't want to leave the trail and some hikers turned around. The woman had a picture of the grizzly. Jan was not in favor of that trail. Bear spray is highly recommended here. You have to stop frequently to take in the views here. The entrance to the hotel has a Swiss feel to it. 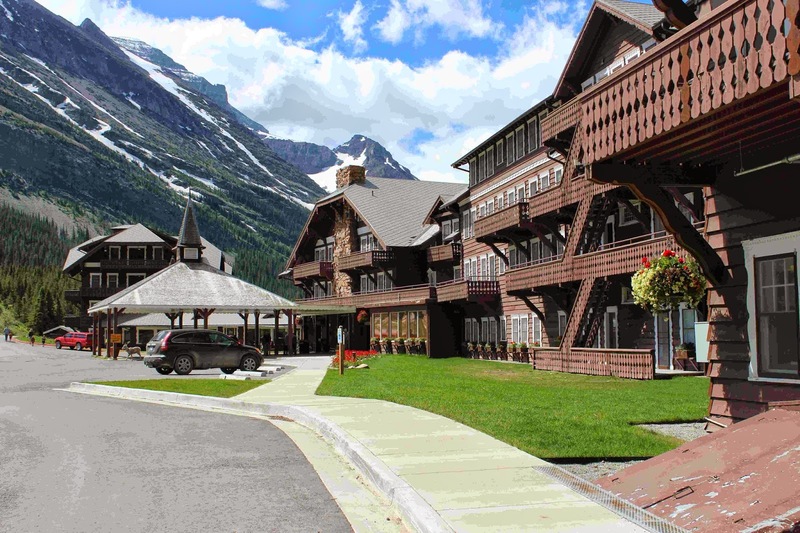 Again, these hotels were built by the railroad owners to encourage tourists to come to Glacier. They were all within a days horseback ride since there were few roads in the park. Jan and I had to take a peak at the dining room. 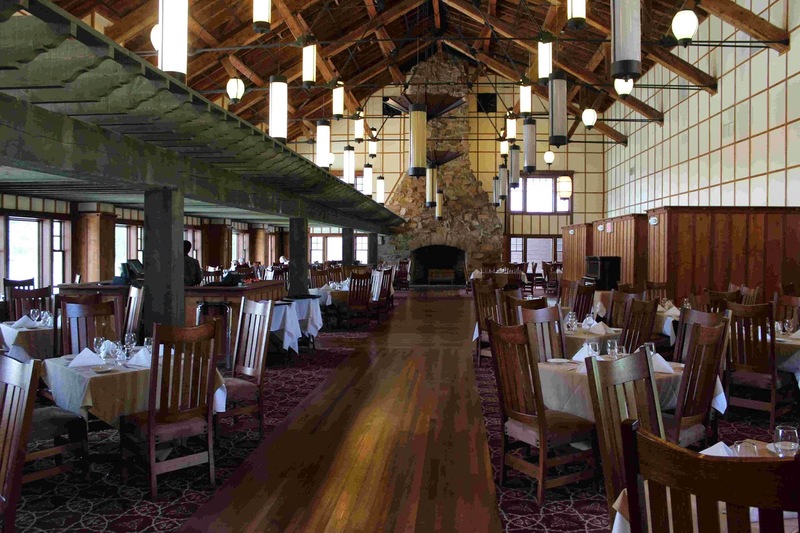 An elegant place with linen on the tables and that huge fireplace at the end. We did not dine here, but I'm sure it would be very good. 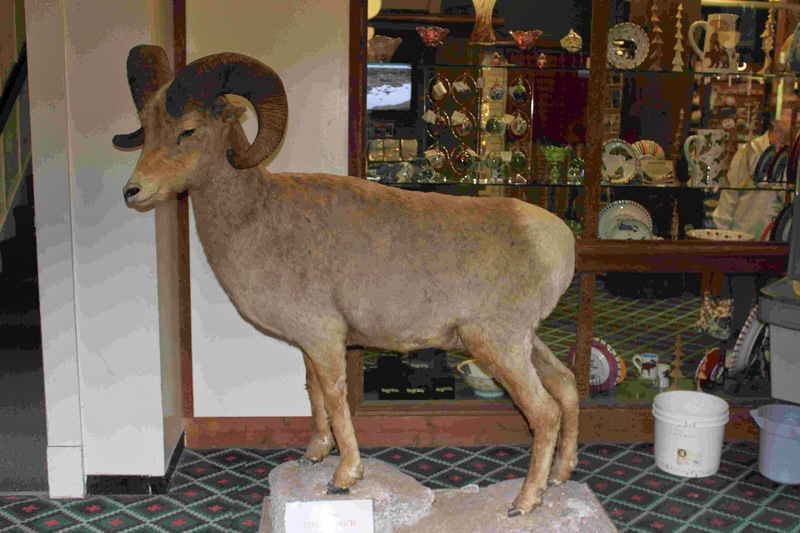 There were mountain goats outside the hotel, but no sign of the Bighorn Sheep. Some regular campers had mentioned seeing the sheep on the hillsides now and then. 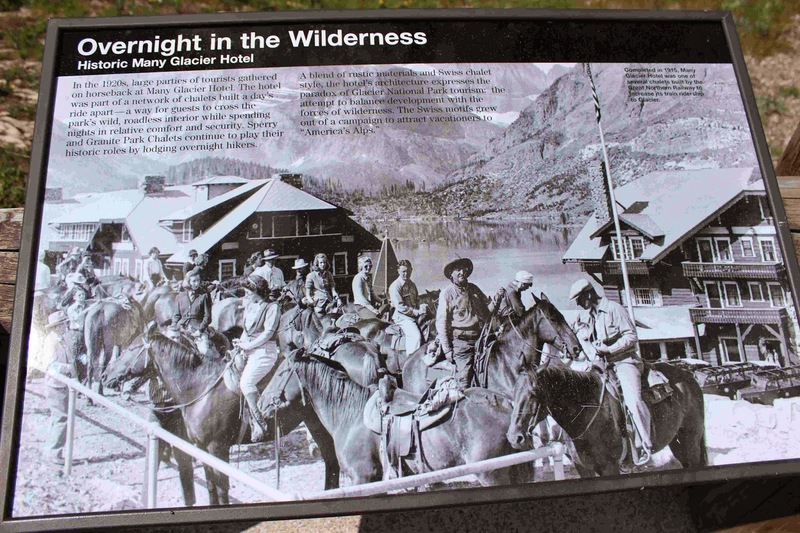 A plaque here gives a little hint of what it might have been like in the early 1900's , visiting on horseback. The views around the lake are definitely impressive. Is there anywhere else that trees can look so small? Jan is checking out a different view back to the hotel. A young man who passed us on the trail is headed back the other way. He says there are two bears ahead. Someone else is mentioning a moose and a young moose off the trail. 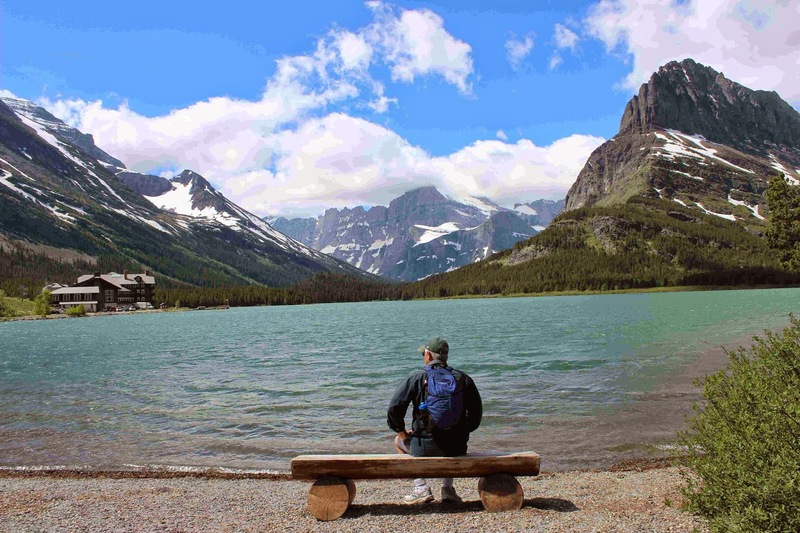 We go on, but we see only beautiful Glacier views. We will leave you with a panorama from the porch of the hotel. Yes, a great place to stay if you are not into camping. There are boat, canoe, and kayak rentals here as well as boat rides. 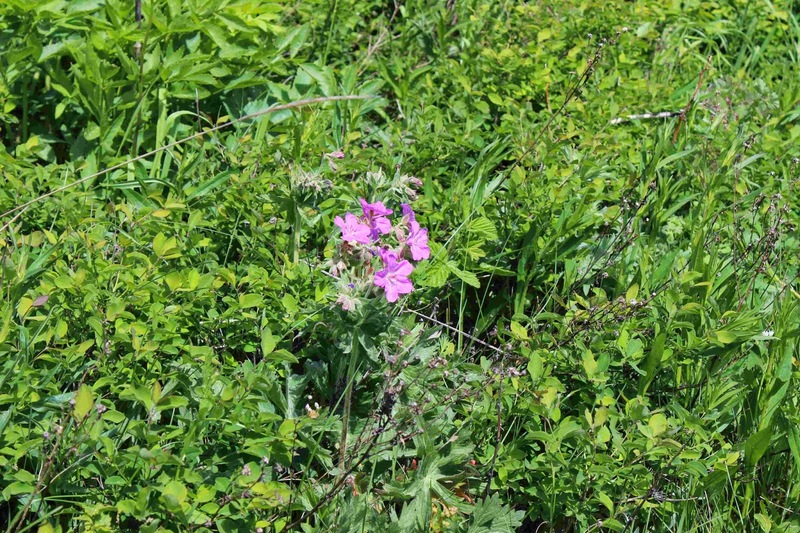 Even in late June, some of the trails were not considered passable due to snow, but there are many trails to choose from.